The 60th Field Regiment, Royal Artillery was a Territorial Army unit from Lincolnshire. The men were part-time "Saturday Night Soldiers", volunteers who trained in the evening or at weekends. Many were friends who'd decided to join up together. One of the batteries (237) was based at the Old Barracks in Lincoln and the other one (239, later changed to 238) had its depot in Augusta Street, Grimsby. The badge of the Royal Artillery bears the word "Ubique"--the Latin word for "everywhere". This was particularly appropriate for the 60th Field Regiment as they had the remarkable distinction of fighting all major foes in World War II. Not only "ubique", but probably "unique" as well! The regiment went to France in 1940, only to be evacuated from Dunkirk a few months later. In 1941 they were part of a small force which took part in a mini Gulf War in Iraq, and they then went on to fight our former allies, the French, in Syria. They were in the 8th Army in North Africa and took part in Operation Crusader where they were in the forefront in facing BOTH of Rommel's Panzer Divisions in the battle at Sidi Rezegh. 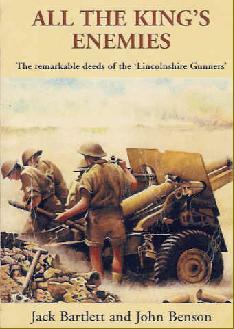 They were then sent to India and had to give up their 25-pounders to train as Chindits. They endured incredible hardships in the hills and jungles of Assam and Burma. From the author (signed), John Benson at 3 Hall Yard, Burton, Lincoln LN1 2RD (£17.50 inc postage; £19.50 overseas). On line by clicking here.